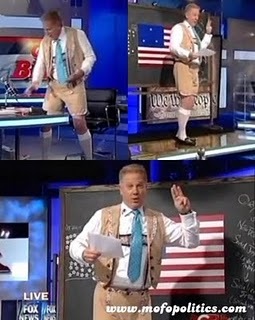 During the October 13 edition of his radio show, Glenn Beck likened the Obama administration’s treatment of Fox News to Nazi persecution of Jews, telling other media outlets: “When they’re done with Fox, and you decide to speak out on something,” it would be like “[t]he old, ‘first they came for the Jews, and I wasn’t Jewish.’ ” Beck has a long history of invoking the Holocaust, the Nazi Party, and Adolf Hitler to smear the Obama administration, other progressive individuals and organizations, and the media; indeed, the Anti-Defamation League (ADL) previously criticized Beck for comparing Al Gore’s efforts to raise awareness of global warming to the Holocaust. But his real worry is that many Washington elitists really don’t like our form of government and want to see it abolished. Beck links health care reform to Nazis, suggests reform would kill elderly and newborns. On his August 6 radio show, Beck suggested that health care reform would lead to the eugenics programs undertaken in Nazi Germany, saying that “three people in the White House are in love with eugenics” and that reform would kill the elderly and newborns. Beck airs photos of Hitler, Stalin, Lenin, asks, “Is this where we’re headed?” On the April 2 edition of his Fox News program, while teasing the next day’s show, Beck asked, “Is this where we’re headed?” while airing photos of Hitler, Josef Stalin, and Vladimir Lenin. Beck has also attacked progressive organizations as “brownshirts.” Beck has repeatedly attacked the “brownshirts” at ACORN and “their henchmen” at the Service Employees International Union. Numerous conservative media figures have invoked Nazis to smear progressives. Media Matters for America has previously documented the conservative media’s invocation of Hitler and the Nazis to smear the Obama administration, Democratic officials, and progressive policies.